Currently, to configure the mute lists, users must go to Special:Preferences and add the username manually to both the lists. 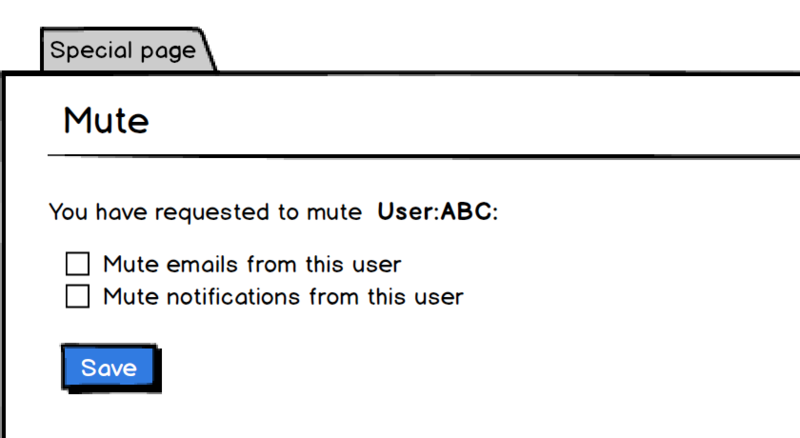 A more streamlined user experience would be to use the Special:Mute page (from T218265: Mute: Add links to disable email and mute specific user to emails sent via Special:EmailUser). This link should only appear for logged-in users. After successfully saving the form, the checkboxes and save button go away and a confirmation message displays: User:ABC has been muted. See all muted users in Special:Preferences. - the link goes to Special:Preferences on the wiki they are on. TBolliger mentioned this in T218263: Mute: Improve the UX for handling local and global mute lists. Before doing this, I think we should merge the list, that way we can just say "Mute this user" and "Unmute this user" which is similar to other systems. I agree that this would make the end-user experience a lot more straightforward. Niharika moved this task from Backlog to Cards ready to be estimated on the Anti-Harassment board.